On our first night in DC, Marcus and I had dinner at Brasserie Beck, a little recommendation we got from Bon Appetit magazine that noted its vibrant cocktail offerings and many varieties of Trappist beer (Marcus's favorite kind). 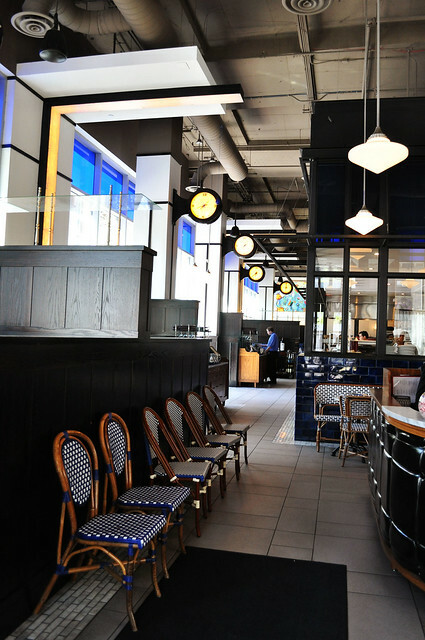 Brasserie Beck is a contemporary European style brasserie opened by Robert Wiedmaier in 2007 where he strives to "stay true to his Belgian roots by creating and cooking casual, affordable fair in the 'brasserie'-style of serving all day from lunch to late night." The bar here also "boasts the City's most comprehensive Belgian beer list outside Belgium with nine draught beers and over 100 offered by the bottle." Chef Wiedemaier is a "stickler for detail and highly organized" where "everything is cooked to exacting standards" undoubtedly stemming from his roots as an "old school saucier" as there aren't many chefs these days who take the time for that anymore. Additionally, he "patiently coaxes the very essence from his ingredients by slow reduction of every bit, down to caramelizing the crushed bones to enhance the final dish with intense natural flavor." I started out dinner with the Sparkling Pear cocktail, a mix of Hangar One spiced pear vodka, ginger syrup, and sparkling wine. It was refreshingly sweet with a slight snappy bite from the sparkling wine and ginger essence. 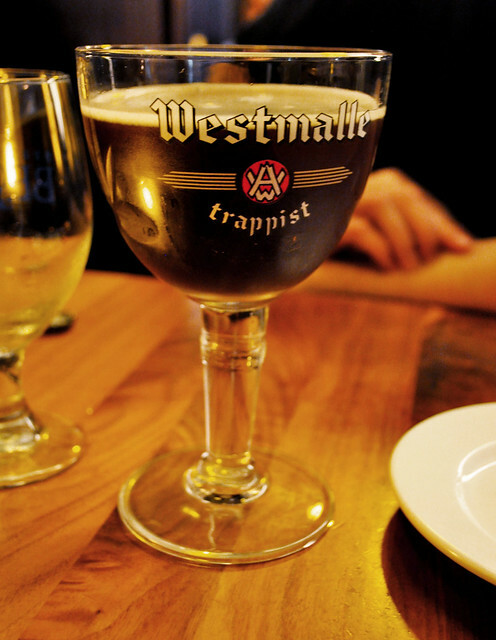 Marcus asked our server about which Trappist beers she would recommend based on his affinity for Chimay Blue. She suggested Westmalle Tripel which was really smooth -- I actually preferred it to the Chimay because it's a little bit lighter. What made it even better was how well it paired with the food we had. 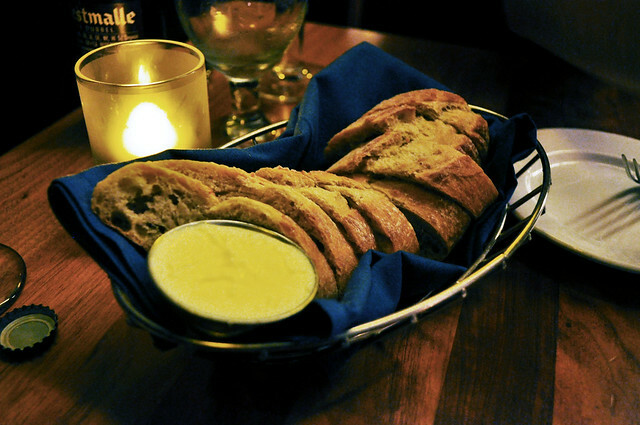 Brasserie Beck couldn't call itself a brasserie without having a solid basket of warm bread to go around. The sliced baguette was crusty yet soft at the center, tasting wonderfully with a tiny spread of softened butter. To start, Marcus and I had a half order of the Penn Cove mussels from Washington State in a classic white wine sauce with roasted garlic (nearly a whole head! ), parsley, and cream. 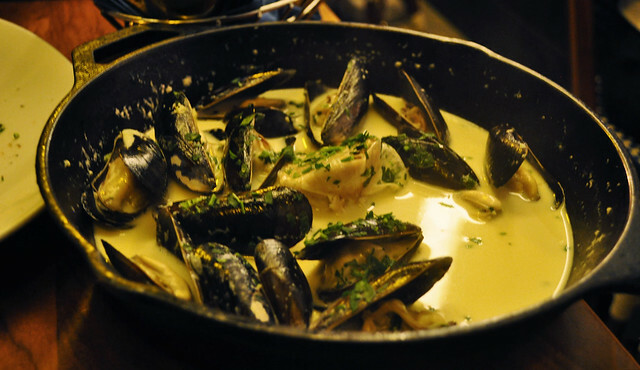 The mussels were pretty plump and nicely soaked up the creamy, garlicky sauce in their little crevices. I could've eaten a bucket of these -- they were THAT good. 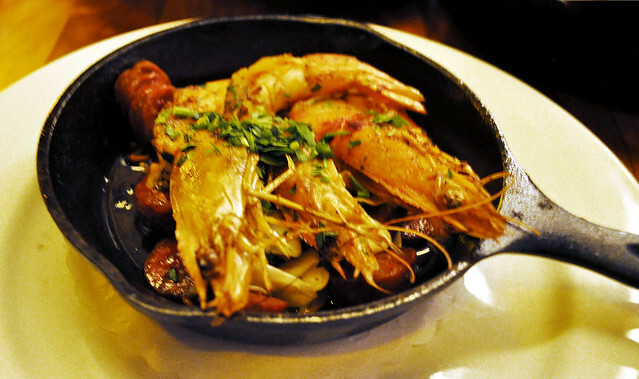 Marcus wanted to try the shrimp and chorizo with smoked paprika and roasted garlic. The shrimp still had their shells on, so it had some additional intensity of flavor to them, and the smoked chorizo was very concentrated in spice and soaked in a whole lot of roasted garlic, too. Though this dish wasn't my favorite of the evening (while Marcus really enjoyed it), I still thought it was lovely. 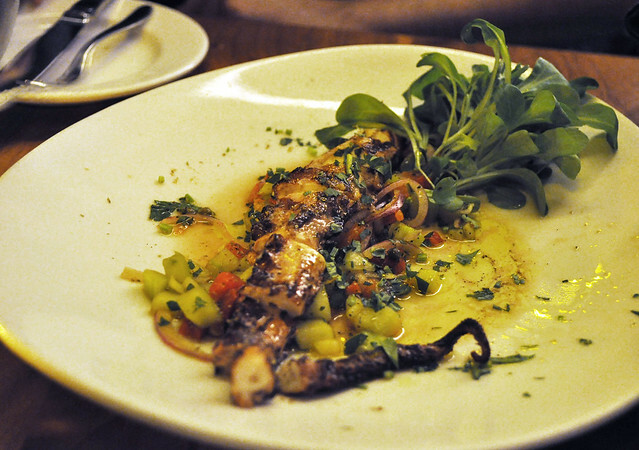 Chances are when we see an octopus dish on any given menu, it will get ordered, one way or another. It was not different at Brasserie Beck, where it served grilled octopus with cucumbers, roasted peppers, shaved red onions, and a wild oregano and caper vinaigrette. You know it's a good sign when the octopus meat is so soft that it nearly melts away upon first bite/chew. Chef Wiedmeier certainly coaxed the flavors and true potential of the octopus, and it went beautifully with the surrounding cucumber salad. The vinaigrette had a well-balanced acidity, providing a lovely dressing to the entire dish. We highly recommend this one to be shared. Given how awesome the cocktail program at Brasserie Beck is, we ordered a second round of drinks -- on the left, Marcus had the Hemingway Daiquiri with white rum, maraschino, fresh lime, and grapefruit juice, while I had the Velvet Blanche with Leblon cachac, Cointreau, Velvet Falernum, and fresh pineapple juice. 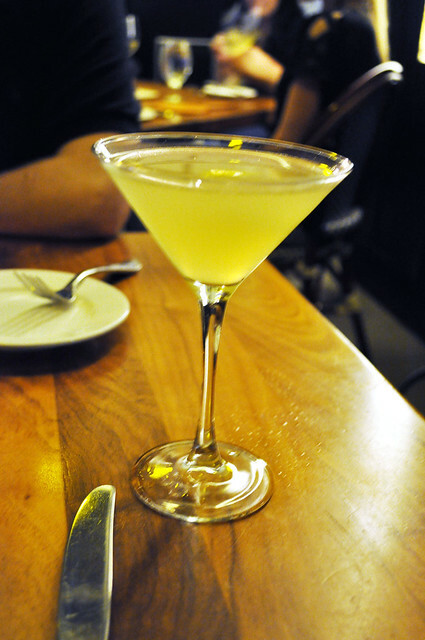 The Hemingway Daiquiri had a very citrusy yet was refreshing enough where it wasn't sour at all. The Velvet Blanche's main selling point is the freshly squeezed pineapple juice -- even our server said that it makes a huge difference compared to the typical cans of Ocean Spray juice. It had a sense of purity overall (the "Blanche" part of the drink), while the remaining cachac and Cointreau gave the drink its character (the "Velvet"). From the three drinks we sampled that evening, you really can't go wrong with choosing something from the cocktail list that caters to your tastes and preferences. 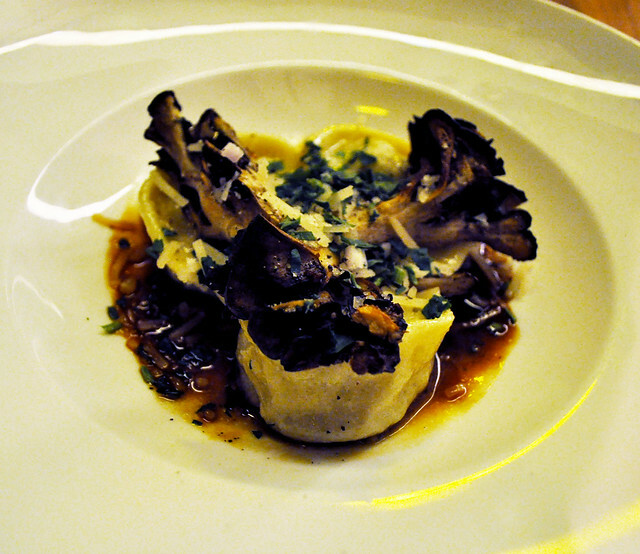 As my main course, I had the short rib and foie gras tortelloni with hen of the woods mushrooms and madeira sauce. Tortelloni is essentially just a larger version of the popular pasta, tortellini, so the three tortelloni was the perfect portion for a more petite main course. The pasta were filled with piping hot pieces of short rib and little lobes of fatty foie gras that collapsed right onto the palate with a splash of madeira. This really savory dish was further enhanced by the blossoms of maitake, giving it a truly earthier flavor. There were some shavings of cheese which melted right onto the tortelloni that added a subtle creaminess. 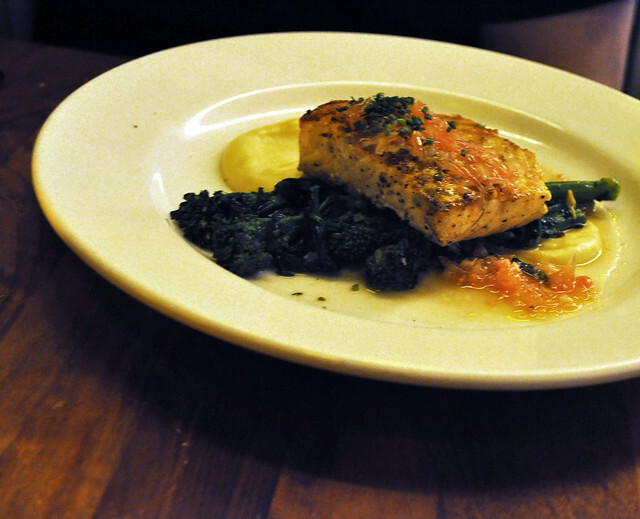 Marcus had the grilled salmon with parsnip purée, rapini, and a ruby red grapefruit vinaigrette. Although the salmon was just a little overcooked, the overall composition of this dish was quite good. The citrus gave the salmon a cool lightness to it, and the parsnip purée balanced it well as a main course. 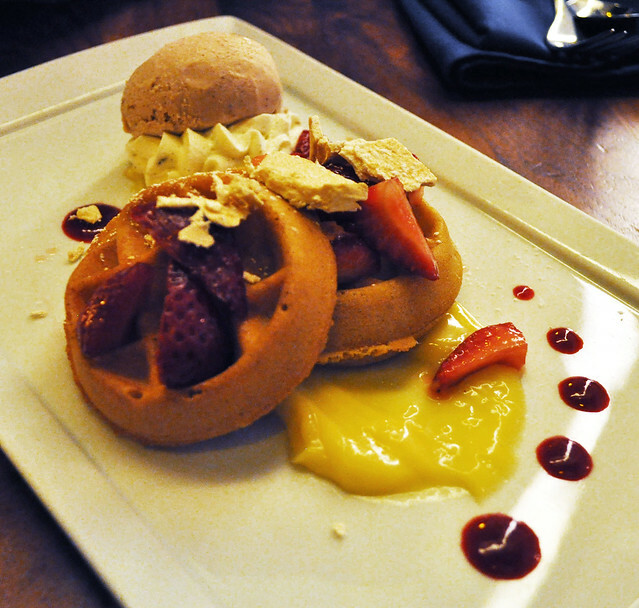 For dessert, Marcus and I shared the Belgian waffles with lemon custard, berries, and cinnamon ice cream. Though I would've preferred a more crunchy waffle, it was still warm and soft with the custard and ice cream. Findings: Marcus and I fell in love with everything about Brasserie Beck -- the food, the drinks, the ambiance, the service. 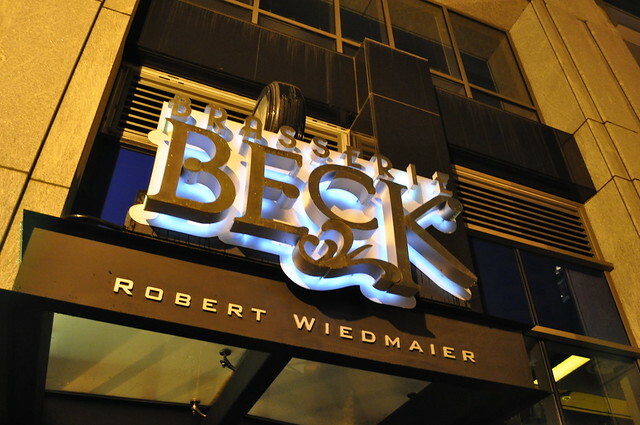 Perhaps it was because the restaurant was our first "fancy" meal during our visit to DC, but I really think it was because Brasserie Beck seemed to closely herald what I would imagine a genuine Parisian brasserie would be like. We undoubtedly had our rose-tinted glasses on with the romantic notion of not only being in a "new" city like the nation's capital but also being in a well-orchestrated microcosm after the City of Light. We ate to our hearts' content, and I couldn't have thought of one other place I'd rather be than sitting in the tucked away booth that we shared at Brasserie Beck. Despite the casual nature of it being a brasserie, the restaurant has this inexplicable romantic effect on you -- like a place you'd go to fall in love with your partner all over again. 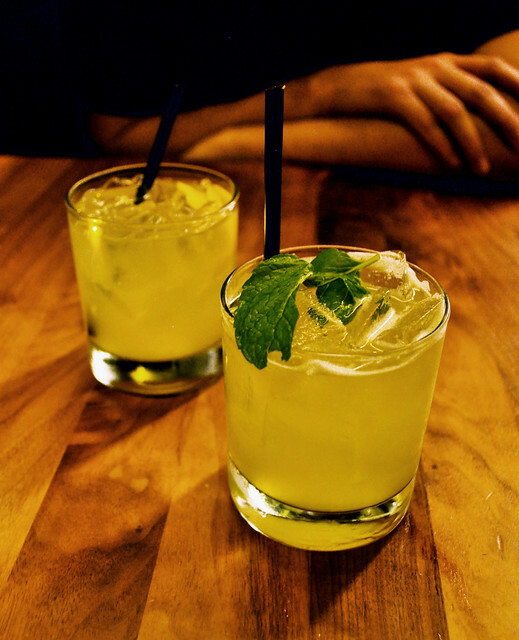 Service was top-notch, the drinks well-crafted, and fare curated to satisfying delight. Maybe a second visit here for us won't quite match up to this initial visit because we somehow transcended to a place where the heart of our stomachs realized something divine, but I know Chef Robert Wiedmaier won't disappoint one bit. Price point: $14 for a half order of mussels, $17-19 for each starter, $26 for each main course. Tags: 2013, American Traditional, Brasserie Beck, cocktails, dining reviews, first visit, French, restaurants, Robert Wiedmaier, three-course, Washington D.C.